During the Netherlands Film Festival, EFSP presents the Unofficial Dutch Film Star Postcards Festival. Today's subject is Grand German-Dutch actress Adele Sandrock (1863-1937), who had a successful theatrical career all over Europe. In Vienna she had a stormy affair with the famous author Arthur Schnitzler, and enjoyed triumphs as the diva of the modern playwrights. In the 1910s she became one of the first German film stars. 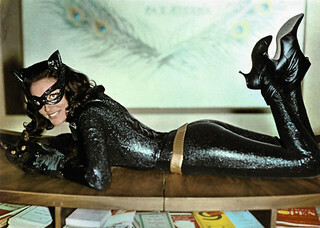 After the introduction of sound film, she emerged as a witty comedienne. She excelled as the intimidating elderly dragon, who could also be surprisingly funny and tactful. German Postcard by Ross Verlag, no. 7363/1, 1933-1934. Photo: FFG. German postcard by Ross Verlag, no. 142/3. Photo: Ufa. 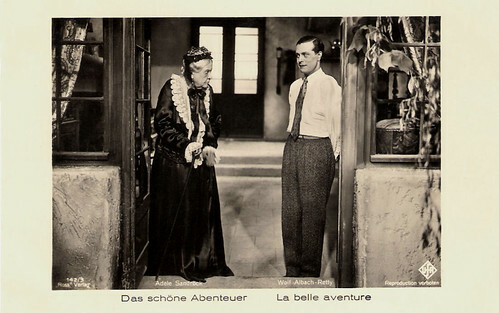 Publicity still for Das schöne Abenteuer/Beautiful Adventure (Reinhold Schünzel, 1932) with Wolf Albach-Retty. German Postcard by Ross Verlag, no. 9448, 1935-1936. Photo: IF. Publicity still for Der Favorit der Kaiserin/The Favorite of the Empress (Werner Hochbaum, 1936). Adele Sandrock was born as Adele Feldern-Förster in Rotterdam in the Netherlands in 1863 (some sources say 1864). She was the youngest of three children of the German businessman Eduard Othello Sandrock and the Dutch ballet dancer and actress Nan ten Hagen. Her siblings were painter and author Christian Sandrock and actress Wilhelmine Sandrock. In 1875 the family moved to Berlin. Three years later, Adele was discharged from school, and she tried to become an actress. Only 15, she made her debut in the comedy Mutter und Sohn (Mother and Son) by Charlotte Birch-Pfeiffer at the Urania theatre in a Berlin suburb. Later, she asked the Duke of Meiningen in a letter to engage her at the Hoftheater (Court Theatre). She chose a scene from Kabale und Liebe (Intrigue and Love) by Friedrich Schiller to show off her talent. The Duchess, a former actress, was so delighted by her acting that Sandrock received a three-year contract. When the famous actor Joseph Kainz refused to play her lover, she was deeply hurt and left Meiningen after only one year. She played in theatres in Moscow and Budapest, and also worked in Spain and France. In 1889 she moved to Vienna, where she had her breakthrough in the title role of Isabella in The Clemenceau Case by Alexandre Dumas and Armand d'Artois at the Theater an der Wien. From 1889 to 1895 she played at the Deutschen Volkstheater (German National Theatre) in Vienna. In 1893 she met the poet Arthur Schnitzler and the two had a tempestuous love affair that lasted for two years. In his works Der Reigen (The Dance), Halbzwei (Two and Half) and Haus Delorme (House Delorme), Schnitzler used his memories of Adele Sandrock. Their intimate correspondence was published in book form. In Vienna, Sandrock became a star and her tumultuous private life and her breach of contracts created some scandals. She became the diva of the 'Wiener Moderne’, the Austrian avant-garde movement. She created a number of major roles for such modern playwrights as Henrik Ibsen (in Rosmersholm) and Arthur Schnitzler (in Das Märchen (Fairy Tale) and Liebelei (Flirtation)). 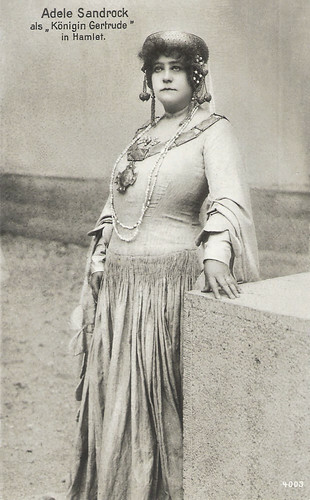 From 1895 to 1898, she worked with her older sister Wilhelmine at the Hofburgtheater (Court Theatre) and later she went on a European tour. From 1902 to 1905 she worked again at the Deutschen Volkstheater in Vienna, but she could not repeat her previous triumphs. In 1905 she moved to Berlin, where she played at the Deutsches Theater under Max Reinhardt. In 1910 her engagement there ended and there were no new parts or engagements. Her highly theatrical style was regarded as old-fashioned now. It was a period of financial hardships. 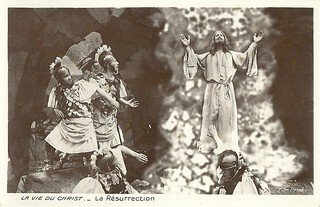 German Postcard by Verl. Hermann Leiser, Berlin, no. 4003. Photo: Photo-Arbeit, München (Munich). 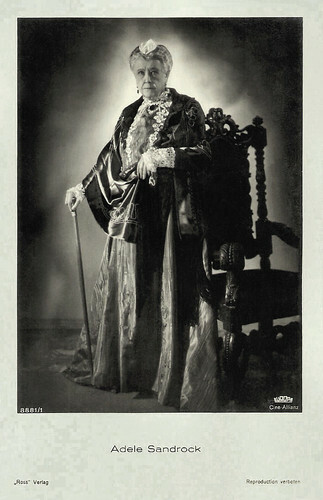 Publicity still for a stage production of Hamlet with Adele Sandrock as Queen Gertrude. Vintage Postcard. 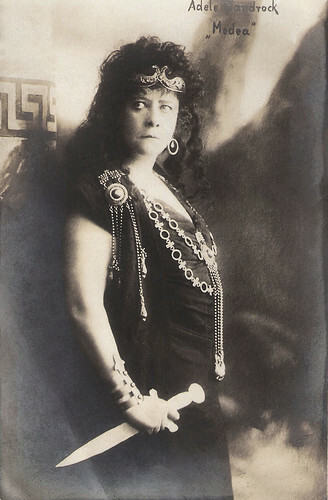 Publicity still for a stage production of Medea. 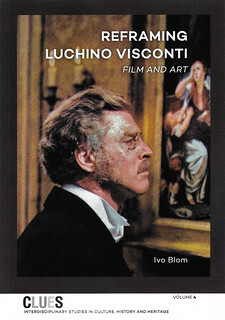 German collectors card by Ross Verlag in the series Vom Werden deutscher Filmkunst - Der Stumme Film, picture no. 197. Photo: Maxim-Film. 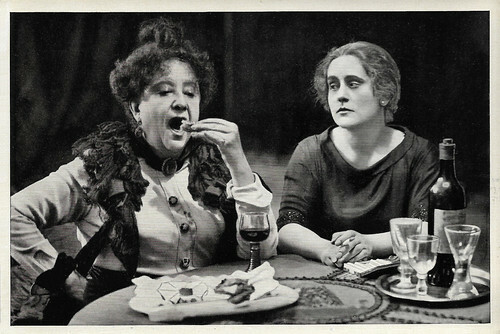 Publicity still with Adele Sandrock and Carola Toelle in Die Schuld des Grafen Weronski/The debt of Count Weronski (Rudolf Biebrach, 1921). In 1911 Adele Sandrock made her silent film debut for the Messter company in the short film Marianne, ein Weib aus dem Volk/Marianne, a woman from the people, starring Henny Porten. It was followed by parts in such films as Die Beichte einer Verurteilten/The confession of a condemned (Rudolf del Zopp, 1915) and Passionels Tagebuch/Passionels diary (Louis Ralph, 1916) with Emil Jannings. During World War I, Adele earned a small family income by giving lectures and acting lessons. After the war she worked more and more for the cinema. To her silent films belong Manolescus Memoiren/The Memories of Manolescu (Richard Oswald, 1920) starring Conrad Veidt, Lady Hamilton (Richard Oswald, 1921), and Kinder der Finsternis/Children of the Dark (Ewald André Dupont, 1921). 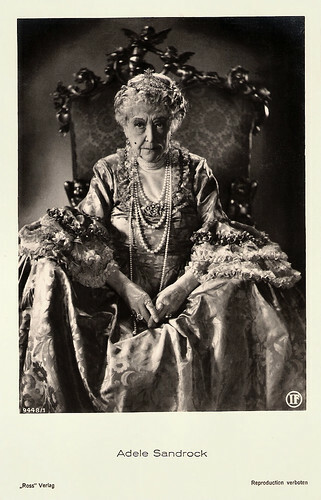 In 1924 she returned to the Netherlands to film Op hoop van zegen/Die Fahrt ins Verderben (James Bauer, Henk Kleinmann, 1924), a Dutch-German coproduction, based on the play Op hoop van zegen (1900) by Herman Heijermans. Other silent films were Die Waise von Lowood/Orphan of Lowood (Curtis Bernhardt, 1926), Feme (Richard Oswald, 1927), the Schnitzler adaptation Fräulein Else/Miss Else (Paul Czinner, 1929) and Katharina Knie (Karl Grune, 1929) with Carmen Boni. 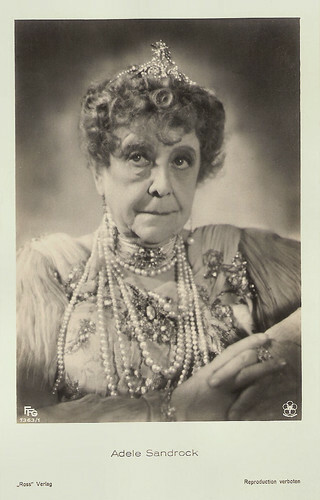 In 1920 the then 50-plus-Sandrock had also returned to the stage, where she again enjoyed great successes, this time as a funny old lady in such comedies as Liebestrank (Love Poison) by Frank Wedekind and Bunbury by Oscar Wilde. It was her second breakthrough, now as a comedienne. Sandrock developed a unique form of ‘unmodern’ comedy. She was hilarious as the stubborn, old fashioned mother-in-law, or the tyrannical grandmother. She still also took serious roles in silent films, but when the German sound film was introduced in 1930, she could use her comic talent fully in the cinema. She appeared in box-office hits as Der Kongress tanzt/The Congress Dances (Eric Charell, 1931) starring Lilian Harvey, Der tolle Bomberg/The Mad Bomberg (Georg Asagaroff, 1932), and Die englische Heirat/The English Wedding (Reinhold Schünzel, 1934). She was a comedian who spoke out for passion. Sandrock even became better known for her film roles than for her stage career, and in 1935 and 1936 she took part in 16 films. Even today people remember her as Juno in Amphitryon (Reinhold Schünzel, 1935). Another classic was her role as a director in Alles hört auf mein Kommando/Everything hears on my command (Georg Zoch, 1935), a title that describes her principal quality. Because of her distinctive deep tinny voice she was called ‘der General’ (the General). During her career Adele Sandrock acted in more than 140 films. Sandrock remained unmarried all her life. She lived with her sister, Wilhelmine in an apartment in Berlin, where she died in 1937. The cause of her death was the aftermath of an accident in 1936. Her autobiography, Mein Leben (My Life), was published in 1940. Promotion card by Ufa. Photo: publicity still for Der Letzte Walzer/The Last Waltz (Georg Jacoby, 1934). German Postcard by Ross Verlag, no. 8881, 1934-1935. Photo: Cine Allianz / Europa. 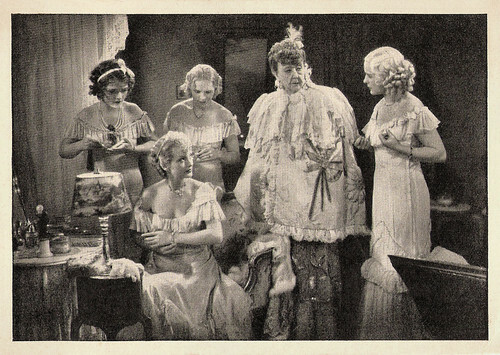 Publicity still for Die englische Heirat/The English marriage (Reinhold Schünzel, 1934). German coffee commercial Die kluge tante Adele/The Smart Aunt Adele. Source: CoffeeInternational (YouTube). Scene from Rendezvous in Wien/Rendezvous in Vienna (Victor Janson, 1936) with Leo Slezak. Source: BD130 (YouTube). Sources: Thomas Staedeli (Cyranos), Stephanie D’heil (Steffi-line) (German), Wikipedia (English and German) and IMDb.